In the previous pAsuram, AzhwAr instructed others to recite the divine names of sarvESvaran (lord of all) to reap the benefit of having been given a tongue. In this pAsuram he says that he has no ills since he has taken the divine names of emperumAn in his heart and sheds all his worries. kURRamum sArA vagai aRindhEn – I knew the means by which yama will not come near me. 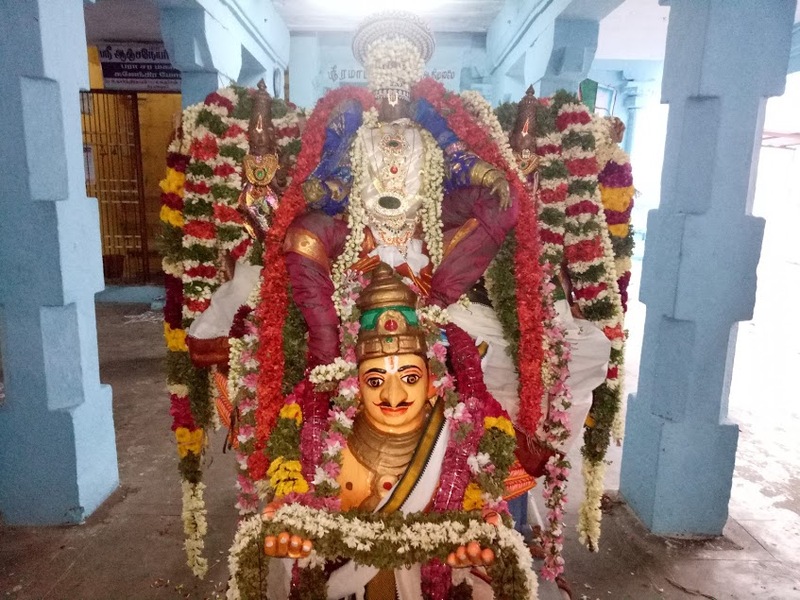 It is apt to recall here some pAsurams from dhivya prabandham such as nAnmugan thiruvandhAdhi 68 “thiRambEnmin kaNdIr” (yama tells his messengers “What I now instruct you, do not go against”), thiruvAimozhi 10-2-1 “kedum idarAyavellAm kEsavA enna nALum koduvinai seyyum kURRin thamargaLum kuRugakillAr” (by reciting the divine name kESava, all the hurdles will disappear; the messengers of yama who indulge in cruel punishments every moment, will not come anywhere near and will run away), thirumalai 1 “nAvalittu uzhitharuginROm namanthamar thalaigaLmIdhE ” (we are walking on top of the heads of yama’s messengers, raising svictorious slogans), periya thirumozhi 8-10-7 “vaLLalE! un thamarkkenRum namanthamar kaLLarpOl” (Oh the magnanimous one! the messengers of yama will hide from your followers just as thieves would hide themselves ) and SrIvishNu purANam SlOkam 3-7-14 “svapurushamabivIkshya” (having observed the supreme being). koduvinaiyum sArA vagai aRindhEn – I also knew the means by which terrible sins, which cause yama to come near me, will not approach me. What is the basis for knowing such means? kadal kidakkum mAyan ARRangaraik kidakkum kaNNan uraikkidakkum uLLaththu enakku – kaNNam (krishNa) lies in kapisthalam on the shores of the river kAvEri in order to be accessible to all those who cannot approach him at thiruppARkadal (milky ocean) where he normally reclines as an amazing entity who is approached by brahmA et al; such krishNa, during the mahAbhAratha war had said, as mentioned in SrI bhagavath gIthA 18-66 “sarva dharmAn parithyajya mAmEkam SaraNam vraja I aham thvA sarva pApEbhyO mOkshayishyAmi mA Sucha: II” (leaving aside all the means for attaining mOksham, along with their traces, hold on to me alone, as the means; I will liberate you from all sins; don’t feel sad). These words will always be in my heart. Thus I knew the means by which yama, cruel sins and ill reputation will not approach me. kadal kidakkum mAyan – he is an amazing entity who reclines in the milky ocean where he can be approached only by a few people such as those living in SvEthadhvIpam (another planet like ours). ARRangaraikkidakkum kaNNan – just as in a town, when a person goes in search of another and doesn’t find him easily, he goes to the riverfront and waits for him there (since everyone comes to the river for their needs), emperumAn also reclines near the river bed, waiting for those who have desire in him to come there to worship him. kaNNan – krishNa, who becomes the matter for everyone’s eyes. kaNNan urai – the charama SlOkam recited by krishNa. Alternatively, we can construe this as emperumAn’s divine names which refer to his svarUpa (basic nature), rUpa (divine form), vibhUthi (wealth) and chEshtitha (divine activities). uraikkidakkum – the heart where his divine names rest. In other words, to me who has the knowledge about him. kaNNan uraikkidakkum uLLaththenakku kURRamum sArA – for me, who has his instructions “sarva dharmAn parithyajya” (letting go of all means) in my heart, there is no fear about yama which haunts those who are engaged only in their varNASrama dharmam (doing whatever is ordained in the vEdhas for one’s classification and status). kaNNan uraikkidakkum ….. koduvinaiyum sArA – there is no scope for me who is fully engaged in krishNa’s instructions, to have any connection with pApa / puNya (vice / virtue) which would befall those who observe certain deeds desirous of end results, which those deeds would give them. ARRangaraikkidakkum – this implies certain qualities such as simplicity which are referred to in emperumAn’s utterance of the word mAm (in the charama SlOkam), which are known as ASrayaNa saukaryApAthaka guNas (those which facilitate his followers to attain him). kadal kidakkum mAyan – this implies certain qualities such as gyAna sakthi which are referred to in his utterance of the word aham (in the charama SlOkam) which are known as ASrithakAryApAthaka guNas (qualities which facilitate his carrying out the activities of his followers). We will move on to the 51st pAsuram next. This entry was posted in iyaRpA, nAnmugan thiruvandhAdhi on August 7, 2018 by T N Krishnan.